Chicken is well known for curing cold. In addition of pepper to chicken in this recipe treats cold in a better way. 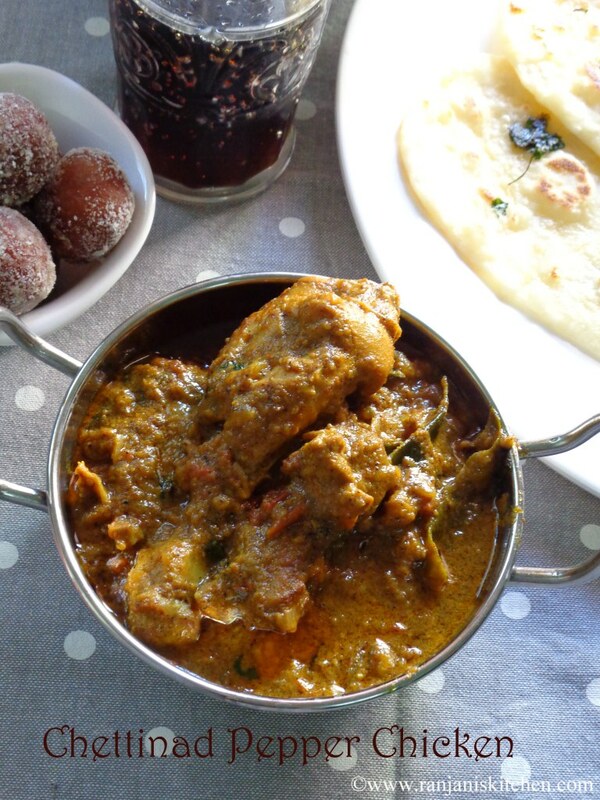 This spicy chettinad pepper chicken is an authentic recipe prepared with coconut milk. Addition of coconut milk makes this recipe rich and creamy in texture. Really it tastes good as very close to the restaurant made. I served this with Naan bread. But surely it goes well with steamed rice and all types of indian flat breads. Lets see the preparation. Wash chicken thoroughly using turmeric and salt. Keep aside. Heat a heavy bottomed pan,pour oil, once it heated add curry leaves. It will give a nice aroma. So no need to add seasonings. Then add chopped onions to it. Saute well till the onions turns transparent and light brown. Now add green chillies and ginger galic paste to it. Stir well until the raw smell of ginger garlic leaves. You can find the proper stage by seeing that paste will start to stick on the bottom. Then add chopped tomatoes and cook well by adding little salt to it.Addition of salt allows tomatoes to cook faster. Cook until it gets mushy. Then add washed chicken to it. Sauté till the chicken colour changes.Saute in medium flame for 4 mins. Then add the spice powders(Chilli powder, coriander powder and pepper powder). Stir well for 2 mins to blend the spices with chicken. Finally add coconut milk and salt. 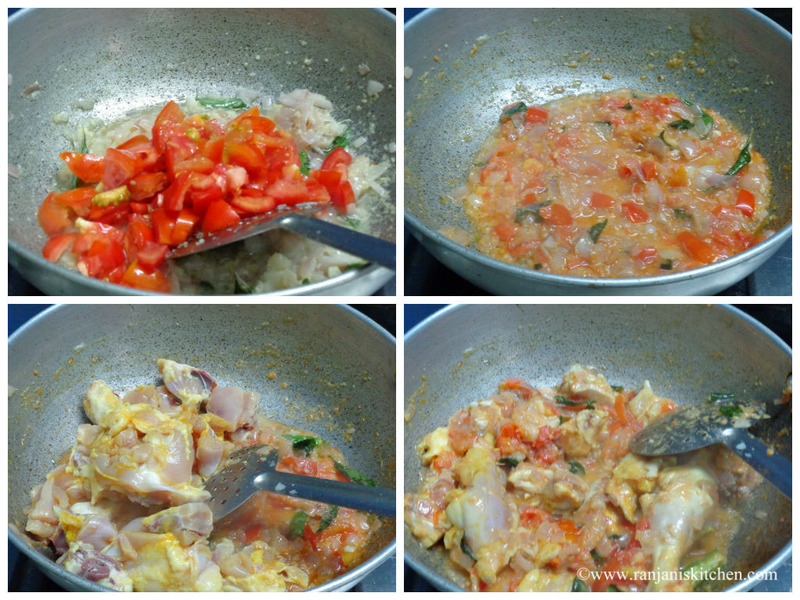 Mix well and close the lid to cook the chicken. Surely it will take 6 to 8 mins. Check in intervals if the chicken is cooked well. 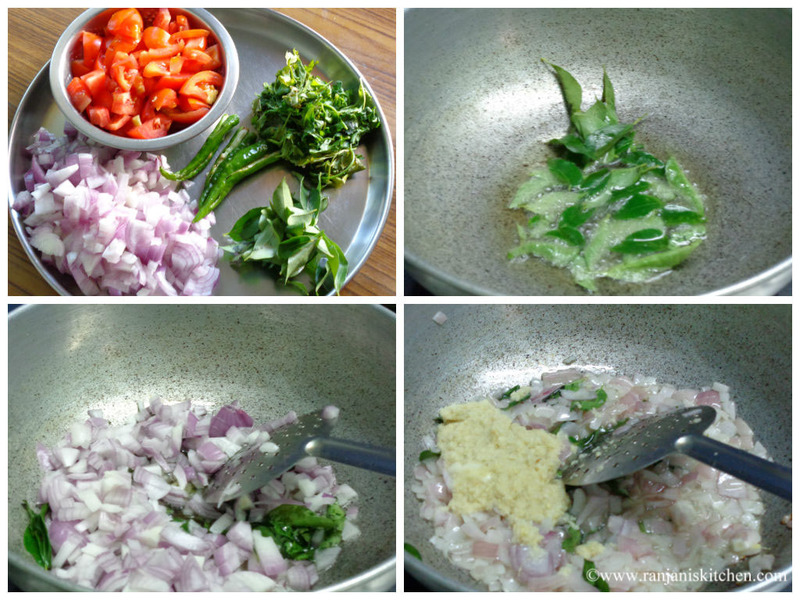 Once it cooked and reaches a semi gravy consistency, turn off the stove and garnish with coriander leaves. You can use water if you don’t want coconut milk. Also, if the coconut milk is not enough to cook the chicken, you can add extra water to it. This gravy will be good without ginger- garlic paste also. You can try that method too. Adjust the salt and spice level as per your tatse. Hi, stopping here for the first time. Nice collection of recipes. 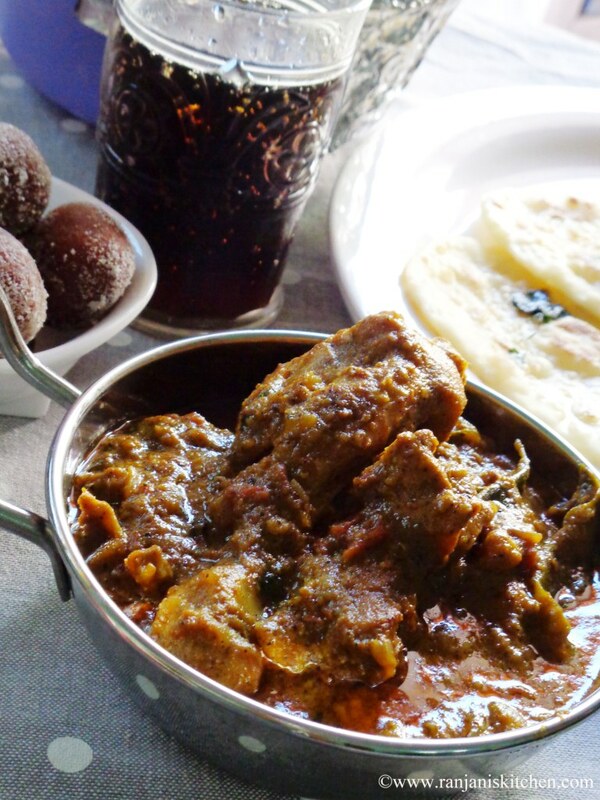 Mouth watering chettinad special chicken.Happy to follow you and will be happy if the same. thanks. 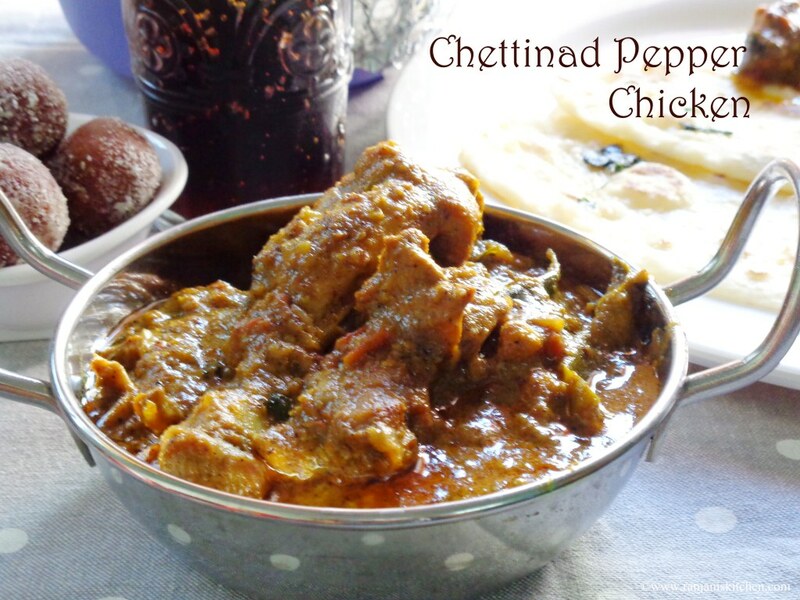 Just saw in CFG and came over here.. Nice collection of recipes and love this chettinad chicken. This chicken dish looks absolutely delicious! Also loved that you included all the stages in your photos. Delicious pepper chicken love the creamy coconut milk in there. d name it self tempting me very much..nicely cooked n gud pics. That’s a creamy, spicy and yummy chicken recipe…. Drooling over your pepper chicken. Thank you very much for this recipe! The cold affected person really felt relieved. Learnt something new today, to add curry leaves before everything else. Truly extraordinary!